Sean with a beautiful Summer Chinook Salmon caught in the middle of Puget Sound at Jeff Head. Jeff Head and President’s Point are as close to Seattle’s salmon fishing backyard as you can get. It is one of my personal favorite spots throughout the salmon fishing season. It is the Central Puget Sound’s largest underwater landmass and is comparable to Mid Channel Bank and Possession Bar, in terms of shear size and popularity. Strong currents push up against Jeff Head and concentrate large schools of Herring, setting us salty Seattleites for some great salmon fishing. Winter Blackmouth and Summer Chinook, Resident and Ocean Coho, Chum and Pink Salmon concentrate on the Jeff Head and President’s Point areas to feed throughout the year. Is there anything better than great fishing so close to home? Where is Jeff Head and President’s Point? Kitsap Peninsula’s Presidents Point and Point Jefferson are the shore side landmarks of Jeff Head. The underwater bar that is Jeff Head extends eastward from Kitsap almost halfway out into Puget Sound (about 2 miles wide). Jeff Head is about 4 miles Northwest of Seattle’s Shilshole Marina, 4 miles Southwest of Edmonds Marina, and 3 miles Southeast of Kingston Marina. It is fully within the boundaries of Washington’s Marine Area 10. The central location makes it great for us who live in or near Seattle. And, it is a short run from launches and marinas in every direction, and it is just as common to see a 15′ Lund out there as it is to see a 28′ Glassply. It is a fishing spot for everyone. Jeff Head is a popular Chinook Salmon fishing spot just across the Puget Sound from Seattle, Washington. Always look at the Seattle Tide Chart before you head out to Jeff Head. 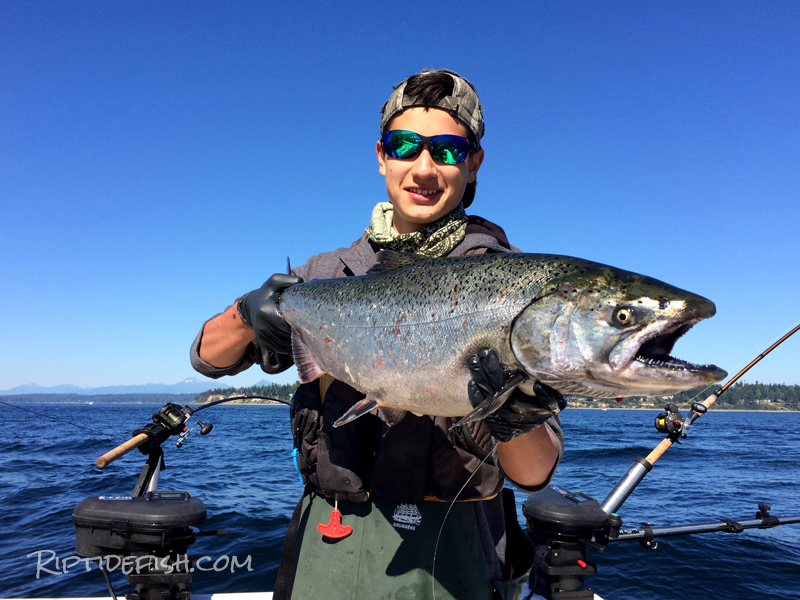 Jeff Head has some of the best early season Coho Salmon fishing in Puget Sound. Resident Coho concentrate along the perimeter of Jeff Head and into the open water to the South of Jeff. Trolling works very well. You can troll fast and cover a lot of water on your hunt to figure out where they are concentrated. Throughout the summer from June to August, these rapidly maturing fish will grow from a couple pounds up to the 6-7 pound range. The table-fare is unbelievable, and you will not find a more beautiful fillet. Troll fast, troll normal Coho fishing rigs, make sure you have herring strips tipping every leader. Chinook fishing season makes Jeff Head a busy place during the summer. For the most part, I like to fish the edges of the bar. The incoming and outgoing currents will push herring along the shelf of Jeff Head. For many years, I had very low confidence fishing here. Mainly because I didn’t understand that pattern of tidal influence on the bait and salmon. There is no quick answer to where the bait will be concentrated, as that depends on what is the stage of the tide and how strong (or weak) is the exchange. 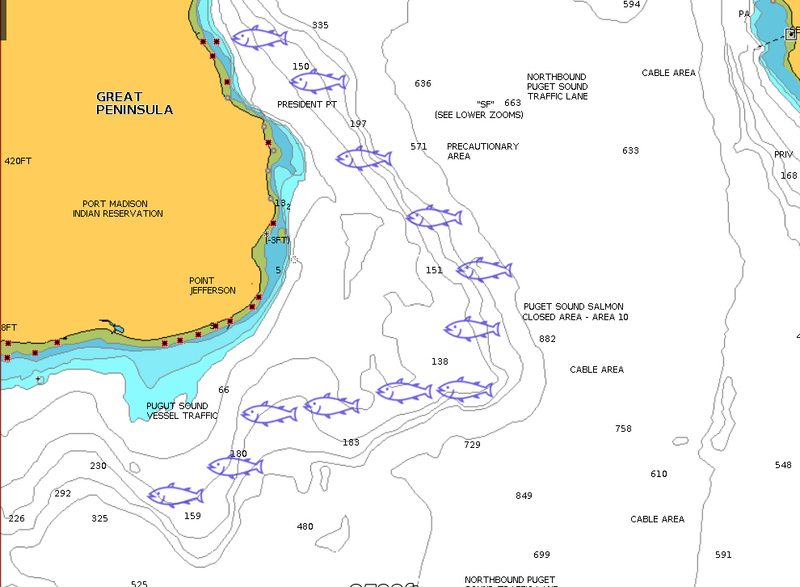 But in general you can search around and find most of the bait on the North side of Jeff Head during the incoming tide, and on the South side during the outgoing tide. President’s Point area is just to the north of Jeff Head, and at times that portion of shoreline can be the go-to area for Chinook. I don’t fish it often, but I have had some stellar summer days trolling here during an incoming tide. I like to troll along the edges of Jeff Head on between the 140′ to 180′ contour lines. Always trolling in the same direction as the current. I do have a few favorite Puget Sound Chinook lures that are my standbys. Gibbs and Hot Spot Flashers, about a 40″-44″ leader to a small spoon or Ace Hi Fly or trolling squid are my favorites. I rarely add any herring strips or scent on my trolling lures at this time of year because Spiny Dogfish will become a nuisance. Finding the bait before you stop the boat to fish is more important when mooching. I will spend a fair amount of time cruising around to find the general area the bait is in. Sometimes it is stacked thick for a couple hundred yards, sometimes a tiny little bait ball can produce limits if the drift goes right. Look for weed patches on the top of the bar also. Jeff Head is alive with fish all year round. The Puget Sound’s resident Chinook concentrate in a few key areas and Jeff Head is always one of them. It is on the top of my list of favorite Blackmouth (resident Chinook) fishing spots. I will fish Jeff Head Blackmouth the same as I do summer Chinook. If I’m trolling it is usually dredging the bottom zone with flasher/hoochie or flasher/spoon. But, if I’m mooching I like to search for bait before deciding what I want my drift to look like. It is a great local option for us Seattleites.